Epic Railroad Building in North America! With over a million variations, Empire BuilderÂ® never grows old. Capture the entrepreneurial spirit of North America and learn to build an empire. 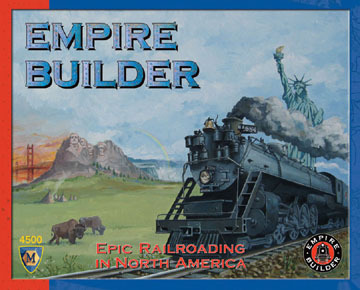 Whether you share Empire BuilderÂ® as an evening with friends or as a rainy day activity with your family, you'll always find it captivating! Empire BuilderÂ® is geographically accurate. The game depicts North America's rivers, mountains and plains, as well as its natural resources. It's a great way to learn about the geography, business, shipping, and transportation of the U.S., Canada and Mexico while having loads of fun with family and friends.